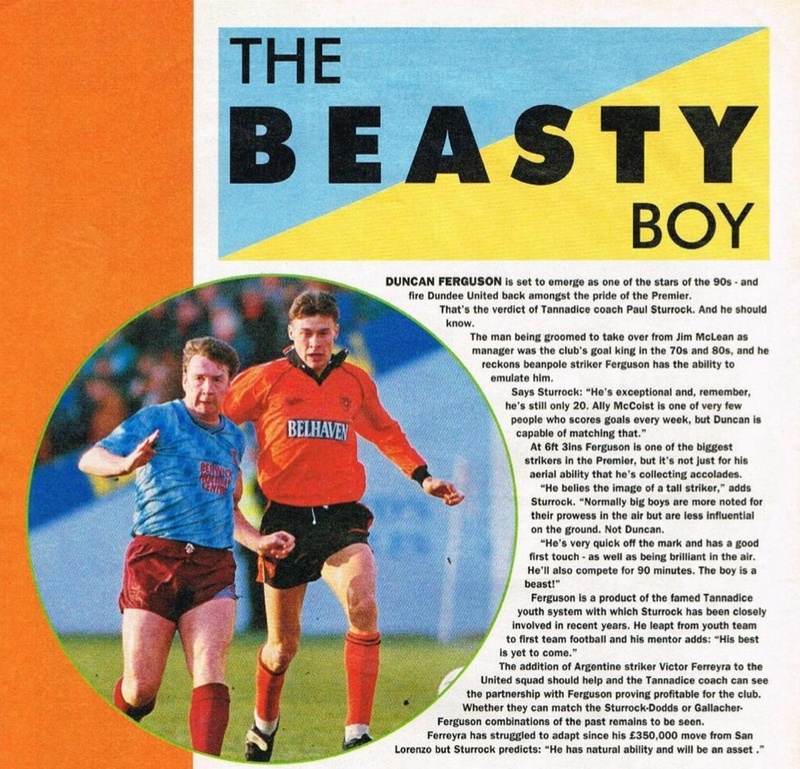 Duncan was a schoolboy international who began his United career in the youth system and was part of the successful BP Youth Cup winning side of 1990. He gradually established himself as a first team regular and became part of the Scotland Under-21 squad. At the end of the 1990-91 season he was a runner up with United in the Scottish Cup. 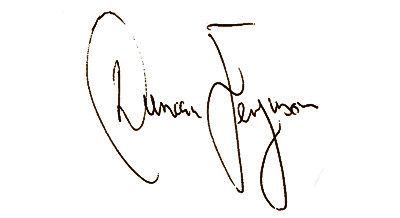 In 1991-92, Duncan was United’s top scorer and his reputation was enhanced by a Scotland cap in May 1992. He went on to win seven full caps. 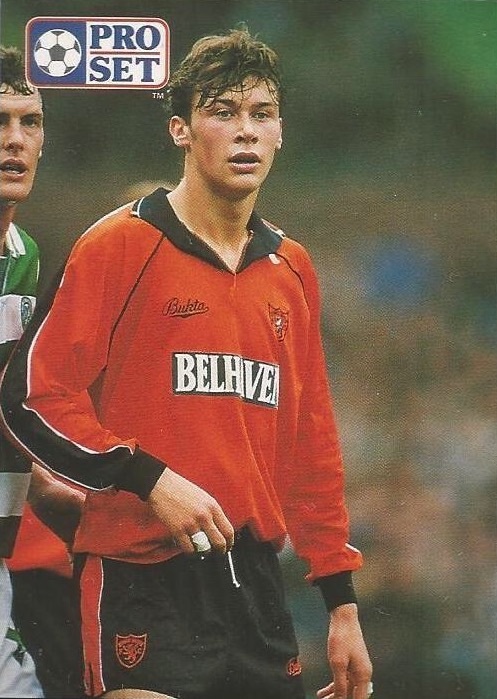 There was reported interest from several clubs before he finally moved to Ibrox for £4m in July 1993. Duncan was born on this date in Stirling. Conditions were misty and the pitch greasy for our visit to Ibrox. Dave Bowman,Christian Dailly, Gijs Steinmann and Brian Welsh were recalled to the side. 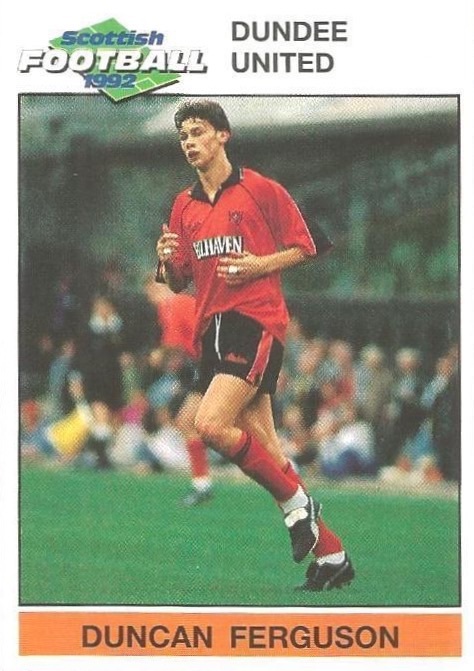 The men who dropped out were the suspended Freddy Van Der Hoorn, Dave Narey, Mixu Paatetainen and Alex Cleland, who was on the bench. 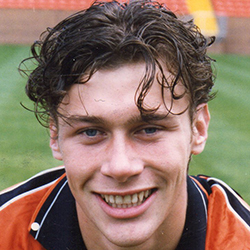 Along side him was Duncan Ferguson included in the first team for the first time. 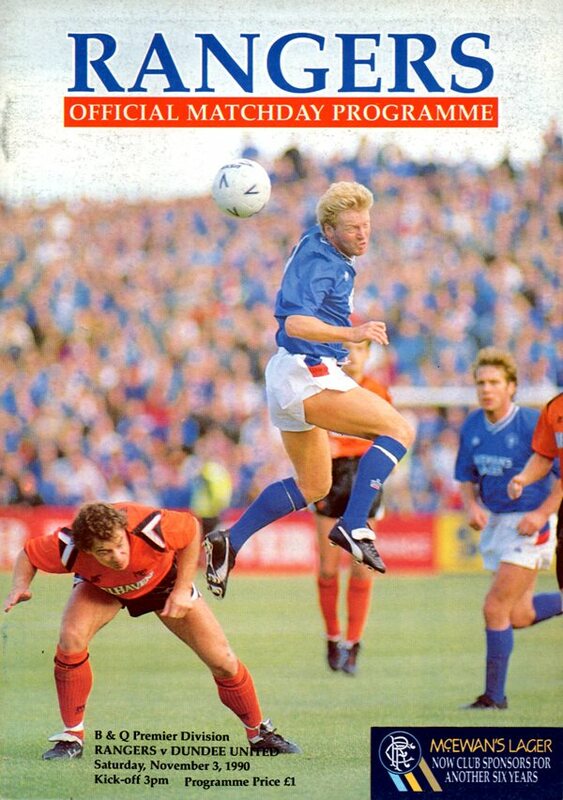 Rangers were first to go close when Hurlock thundered a volley just past after three minutes. The Ibrox side then squandered, or rather Alan Main's brilliance prevented them taking the lead. Brian Welsh was adjudged to have pushed Hateley in the box, but Alan Main dived full length to save McCoist's spot-kick and then throw himself at the Ibrox striker's feet to block his follow up effort. That was to be the first of several tremendous saves by the United keeper. After the narrow squeak at Bayview, it wasn't anticipated that this replay would prove any easier than that initial meeting. In many ways the second match was a mirror-image of the first. East Fife again played their bustling, containing game and even took the lead at exactly the same time as they had done the previous Saturday! The major difference this time was that we gave a far more disciplined display which brought us an equaliser within ten minutes of the Filers going ahead, although it took us until extra-time to finally breakdown the Fifers brave and stubborn resistance. 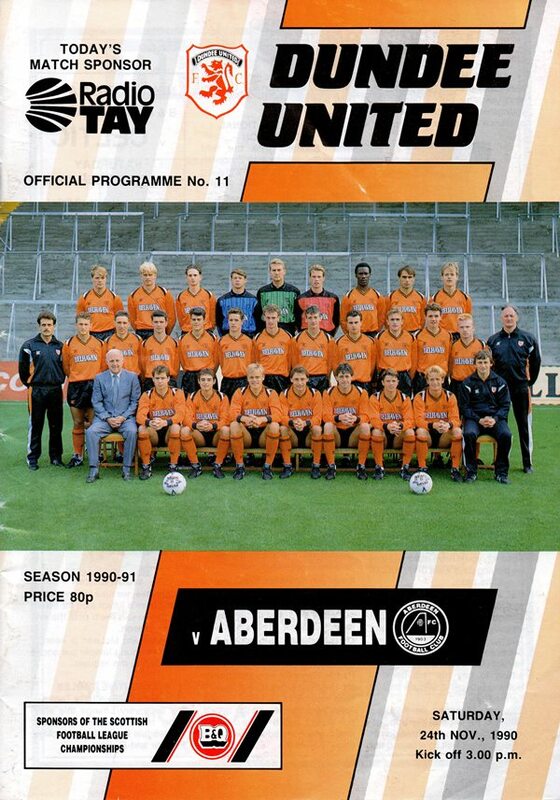 For the replay, manager Jim McLean made two changes. Michael O'Neill came in for Brian Welsh whilst Duncan Ferguson took over from Christian Dailly up front. The two displaced players were on the bench. Although we had a few openings in the early stages East Fife once more tried to frustrate us and did so with more than a modicum of success. On the half hour mark the Fifers, as they had done on Saturday, shocked us by taking the lead. Cowell, Saturday's goalscorer sent over a cross which Stuart Wilson met on the volley and directed a shot just inside the post. 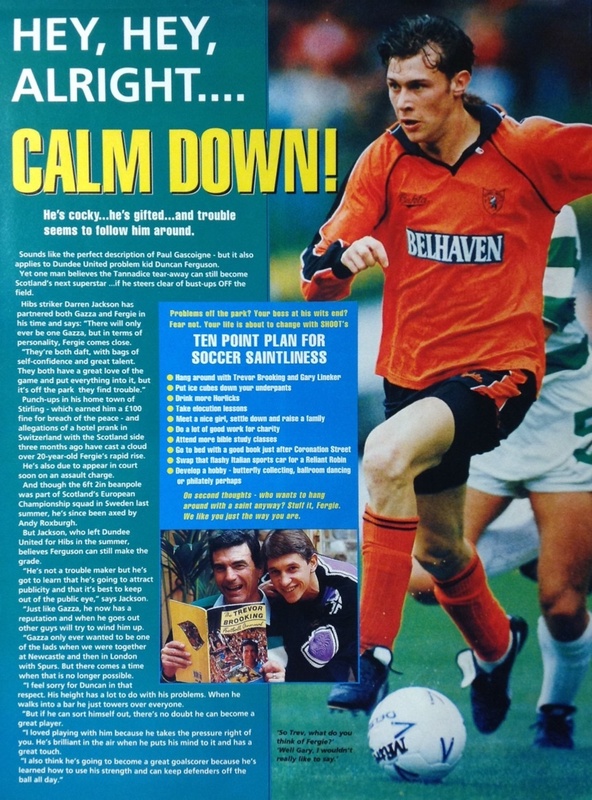 Immediately we were stung into retaliation and Duncan Ferguson blasted over, and then Freddy Van Der Hoorn shot narrowly past after a neat interchange of passes with John Clark. Unlike the previous match, there was only a short period of anxiety before the equaliser came. Five minutes before half-time Darren Jackson sent over a cross which Duncan Ferguson headed down which allowed John Clark to blast in the equaliser from just inside the box. Play raged from end to end right from the off, but we fell behind to what only can be described as a bizarre goal. In attempting to clear, skipper Maurice Malpas knocked the ball straight up in the air. 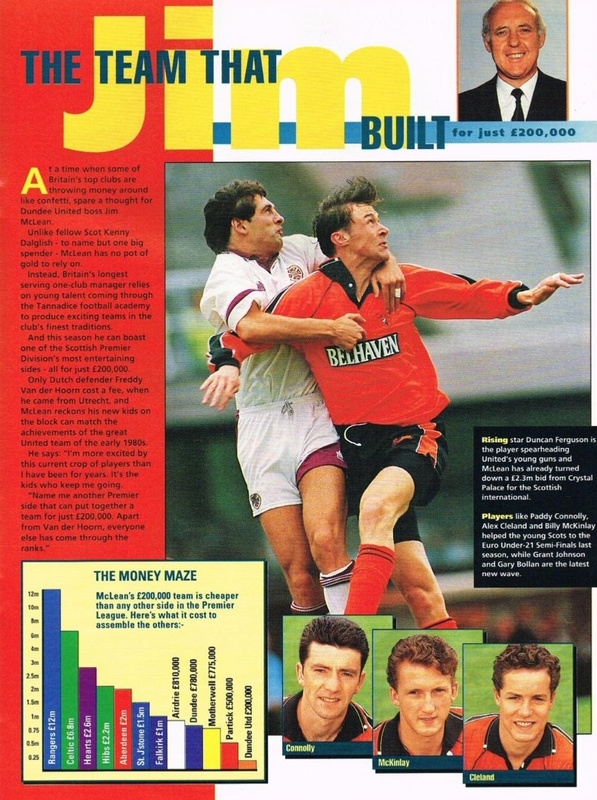 Nicholas failed to control it when it came to ground and the ball ran loose to Frank McAvennie who squeezed it home. Defeat was something the home side couldn't contemplate given their precarious league position and there is no doubt that the Bairns made the more brisk beginning. However, United went on to dominate the remainder of the half and eventually went ahead two minutes before the interval. Freddy van der Hoorn back in the side for the first time in two and a half months played a ball up the left and Paddy Connolly cut inside before slotting the ball into the far corner.